Yep, crushing that 500 Linkedin connections goal line isn’t hard to achieve. In fact, I was able to do this in just 10 to 15 minutes a day in barely 7 weeks and went from less than 100 Linkedin contacts to getting the 500+ Linkedin connections badge. Truly it was very simple and I mean that ever so sincerely for those of you that may think it’s impossible to do. I realize it’s one thing to say it and another to do it, but you’re here for my story so let me share more of the details with you now. I’ll start with showing you this image as seen below of where I started and as you can see.. things just kept getting better and better. The arrow indicates actions taken from week to week. Through this post, you’ll see the progress from week 1 to week 7. 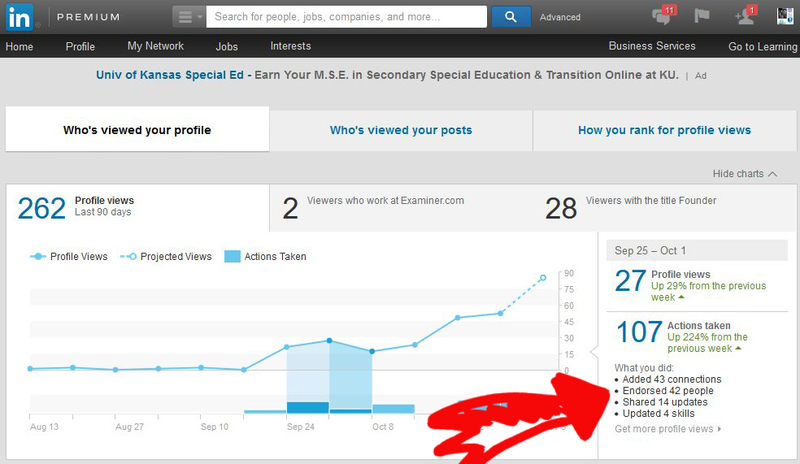 Now, in spite of what you see in the image (and I’ll show more later), you may also wonder why Linkedin matters. Well the best comparison that I can make in terms of it’s importance is to look at Facebook. Facebook is the mammoth of social networking. Nearly 1 in 4 people on the planet have a Facebook account. Thanks to data referenced from DMR (Digital Stats & Gadgets) in Linkedin’s first month online it had 4500 registered users. Today, Linkedin has 467 million users. There are 2 new Linkedin members signing up “every second”. Linkedin sees over 106 million unique visitors per month and is in over 200 countries worldwide. Are you starting to get the picture ? If Facebook is the king of social networking, then Linkedin is the king of “professional networking”. 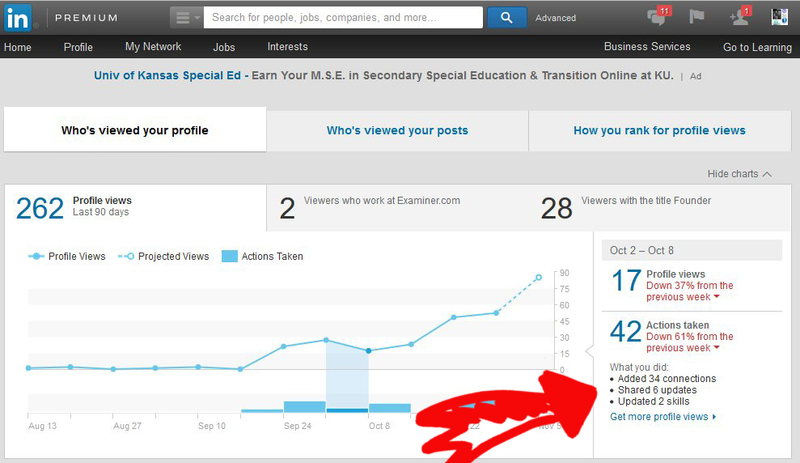 I had started on Linkedin well over two years ago from the time of me writing this post. Now if you’re like me, you got a one of those annoying default connection requests to join and have deleted or ignored them. Why’d you do that ? The default connection requests are just terrible and almost always trigger that urge to hit the delete button without thinking twice about it right ? Nevertheless, even as awful as those default connection requests are, I still joined. 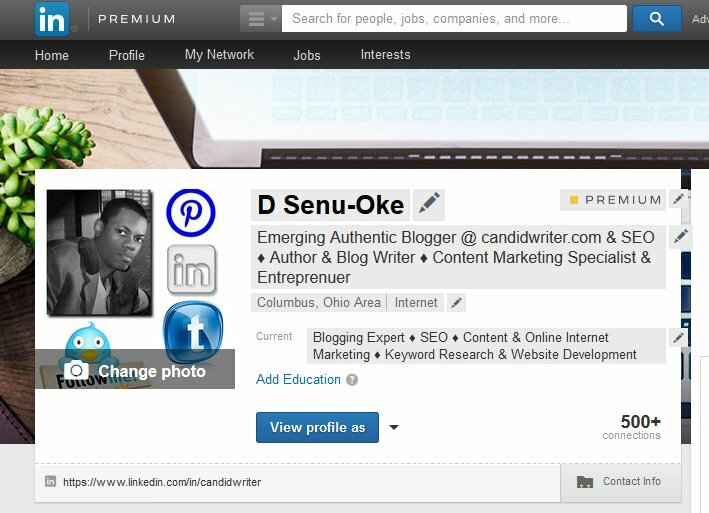 Not through the default request, but on my own by simply visiting the www.Linkedin.com website. Once I got started with Linkedin, it was “slow, slow slow” and things looked a bit different that’s for sure. It’s great and all getting your Linkedin profile set up, but it becomes clear very quickly that if you are going to make any headway or have any success on Linkedin, you will need to grow your network. Growing your network whether you’re going through the Linkedin full site or through the Linkedin app, Linkedin connections are a big key to success. With that said, let me start to take you through how to set everything up to the culmination of what it requires to get to the Linkedin 500+ connection achievement. Granted, if you’ve read anything about Linkedin, you already know that you need to get your profile set up. This is the topmost shot of my profile. What do you see ? Relevant keywords is what you see. Think keywords as you are developing your profile. While this may seem like basic advice, why is it that many people don’t do it ? Each tidbit that I will share is meant to leverage your ability to be successful on this networking and blogging platform. What I have discovered is that Linkedin’s algorithm is pretty simple in how it functions. Focus on making everything about your profile relevant. This will be good for you, good for the Linkedin search engine as others look for professionals like you and for those people that you will ultimately be connecting with that will feel more confident connecting with you because of how “relevant” and clearly spelled out your profile is. On my own profile, I did not complete the section on Education or Language and quite honestly, not completing those sections didn’t diminish the goal of getting to 500 Linkedin connections at all. Experiences and performance may vary depending on the niche but for me it made no difference at all. Now a key piece of information I will give you is that you should add at least 2 to 3 posts to your Linkedin profile. Posting to Linkedin Pulse increases the authority of your profile, improves your credibility and it gives visitors an opportunity to read your content which can also lead them to clicking through to your website or blog too. You will also notice that on my own profile, I have added 3 posts at the time of writing this post to my profile. Beyond the posts, you also want to make sure that as you develop your summary and experience sections that you are focused on “again” adding the relevant keywords within the context of what you’re writing in those two areas. Linkedin pays close attention to these content sections in your Linkedin profile and the more relevant you can make this to your industry and niche only helps to boost your ability to be found in combination with the overall size of your Linkedin network. I know I’ve said a lot without entirely disclosing what I’ve done that really pushed me to the success of increasing my connections by over 400%. Remember that I said it was disgustingly simple right ? Well I absolutely mean that. I set out to make every connection a personalized connection. That’s really all it came down to at the core of my success minus some of the details that I’ll convey to you now. My choice medium was through the Linkedin app. I know that sounds crazy and time consuming but it really wasn’t that bad at all. Who am I going to target ? How much time to devote to this ? What is the message I’m going to send out ? I knew that if I didn’t see any success after the first week that I’d have to revise my plan. Bloggers, small business owners and entrepreneur’s. I was only going to devote 10 to 15 minutes to this per day. Now don’t get me wrong some days I spent more and some days were less but it wasn’t anything that digressed too heavily from the 10 to 15 minute timeframe. I came up with 2 message templates that would go out to everyone “depending on the category” that was far better than the “default” connection request. These are images from Week 2 to Week 7. You saw Week 1 in the first image at the start of this post. This simple, yet effective strategy was EXTREMELY WELL RECEIVED by the overwhelming majority of people that received a message from me which was a great confidence booster that kept me going throughout this process. Ultimately, my messages were thoughtful, relevant to each professional and was not the standard default message as seen in the default connection request on Linkedin. I had a plan to connect with others that were relevant to my industry and what I do as a blogger and what happened was that I went from less than 100 connections to over 500 in barely 7 weeks time. My message templates were basically that I was looking to connect (the who depended on their industry.. refer back to who I was targeting) and that I hoped they would be interested in doing the same. Now surely it wasn’t that short, but each message was about 50 to 60 words total and I also spoke of my appreciation of their time to read the message. Additionally, for each and every connection request that was accepted, EVERY connection received another personalized reply for me as well. When was the last time you received a personalized connection request from a Linkedin member. They are done so infrequently that it may as well be a way to hack your way to 500 Linkedin connections. Truly there is no huge secret to expanding your network. What this formula or strategy ended up being for me is a way to show that if I’m going to express interest in connecting with another professional, the best “first impression” that I can make is to show them that I care enough about the connection to take the extra minute to tell them why I want to connect and to do what most other people on Linkedin “aren’t” doing and that’s taking a step beyond just clicking the “connect” button. If you take this advice and start personalizing your connections, you are inevitably going to start seeing your connections grow just as I did too. With that said, if you’re connecting through the Linkedin app, once you find someone you’d like to connect with, there’s an image with 3 dots in their upper right hand corner of their profile. Just click on it and you’ll see the option “personalize invite”. Click on that and add your message and send it. 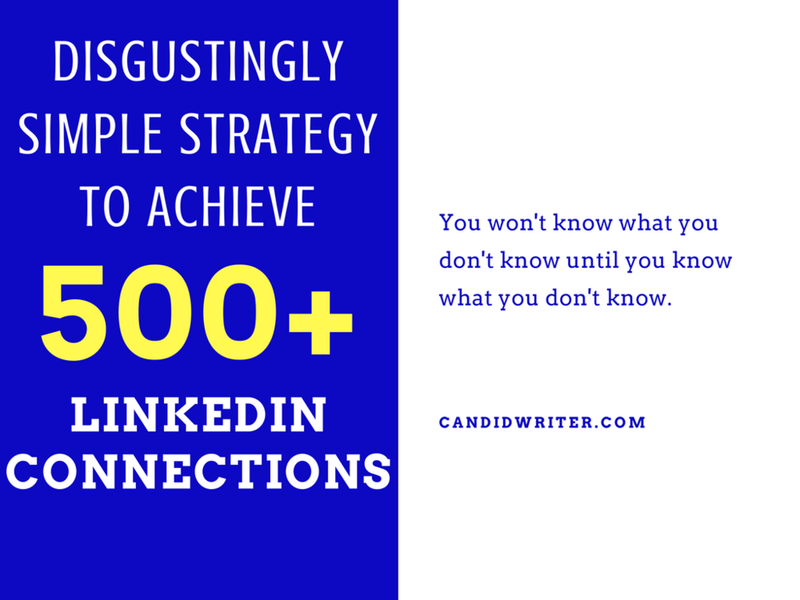 I hope you’ve enjoyed this post and my insight on getting to 500+ Linkedin connections. I look forward to hearing about your experiences and feedback too. Thanks for reading and please use the share buttons below.